This was my first trip to Adelaide and I will admit that I didn’t know a lot about this city. In fact I knew two things about Adelaide. One was the Barossa Valley and the other was the Grand Prix (until Melbourne stole it). Actually come to think of it, I remember reading once, that Adelaide was once called the city of churches. Not because there happens to be a lot of them, but because there are many religions that co-exist in Adelaide. Now, as I was a first time visitor to Adelaide, I began digging around the internet to see what I could actually see and do in Adelaide. Once I got searching, I found myself asking why haven’t I visited Adelaide before? 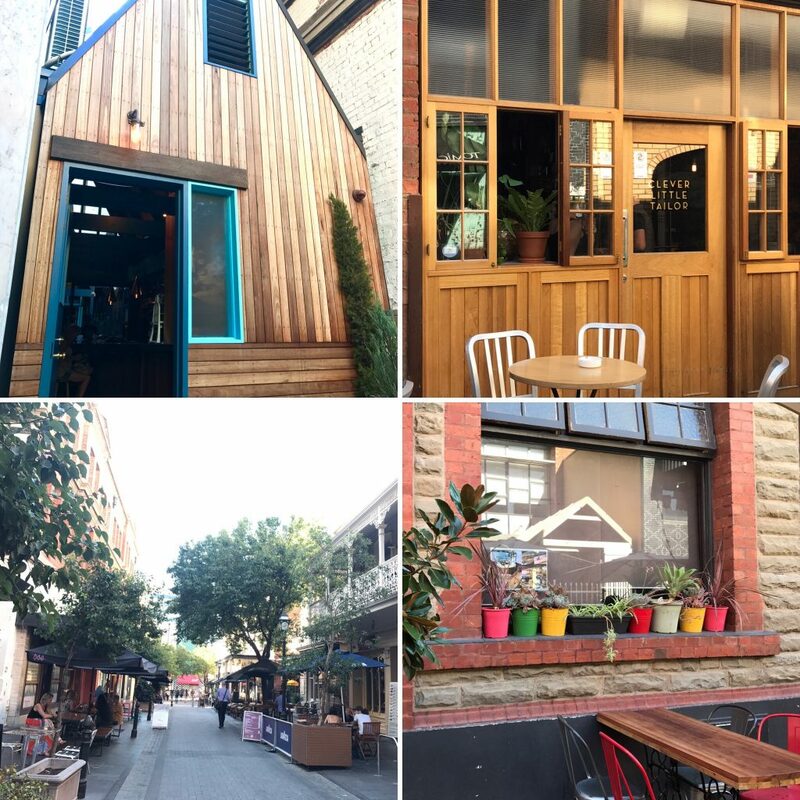 There is plenty of interesting and fun things to do in Adelaide and the only limit you have is the time you set yourself. 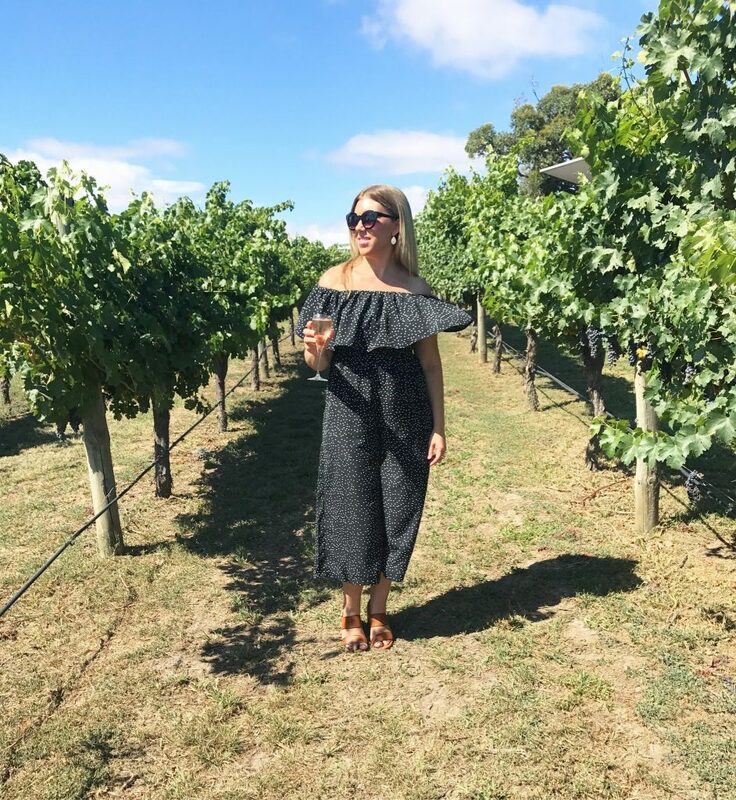 For my visit, I had four full days to see the sights and sounds of Adelaide, including visiting a few wineries and experiencing the Adelaide Fringe Festival. In fact March is a great time to visit Adelaide for a number of reasons. Firstly the Autumn weather is perfect for outdoor activities, as it’s not too hot and it’s not too cold. Secondly, there are two major events that happen in Adelaide, the Adelaide Fringe Festival and the Clipsal 500 Supercar race. These two events draw in big crowds, with the Fringe festival being a month long event. We (my mum and I) landed in Adelaide at about 10.30 am after catching an early flight from Melbourne. Melbourne is just over an hours plane flight from Adelaide and flights can be found quite cheaply with low cost airlines, such as Tiger Air and Jetstar. I was lucky to get a return airfare for $40 with Tigerair. Tip: It pays to be on these airlines mailing list for future deals. After a bit of research, I decided against staying in the CBD and chose to stay at the beachside town of Glenelg. Glenelg is a 10 minute drive from the airport and a 30 minute drive to the CBD. There is a tram (the only tram) that goes directly to the CBD every 10-15 minutes, which we found very handy. The tram is very cheap too, an off peak ticket will set you back around $3.40. We grabbed a taxi from the airport which cost us $24 AUS. As we arrived well early in the morning, we couldn’t quite check into our hotel, (Stamford Grand Adelaide), so we opted to go out and search for a brunch place. A quick 10 minute walk along the gorgeous beach and down Broadway Street, we came across The Organik Store and Cafe. This is a really popular cafe with the locals and on the weekends it’s a buzz of activity. 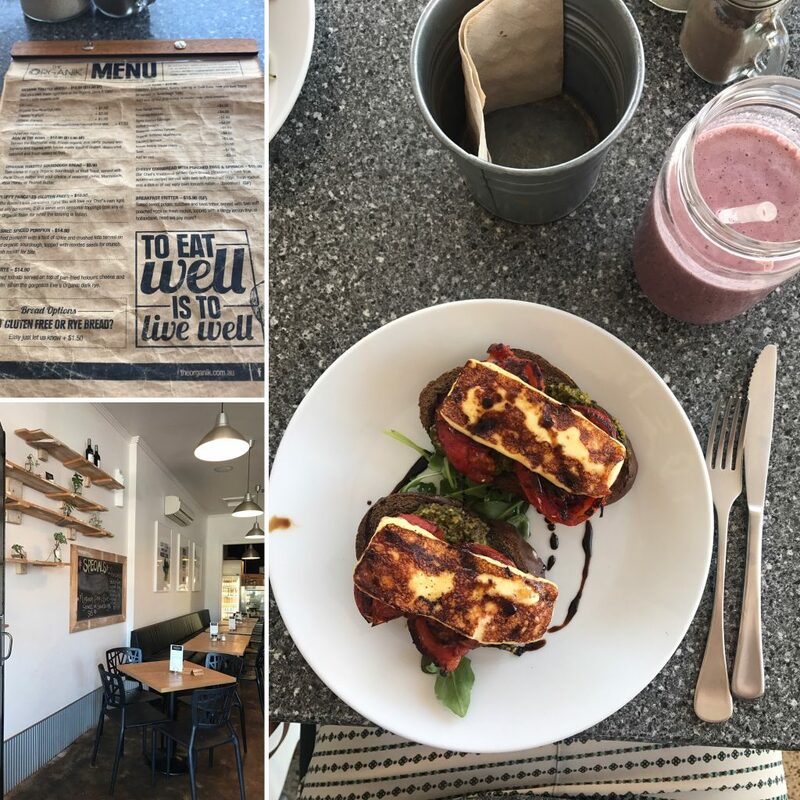 Serving beautiful organic food, with healthy smoothies and juices. By about 12.30 p.m, the Stamford Grand phoned to let us know the room was ready. 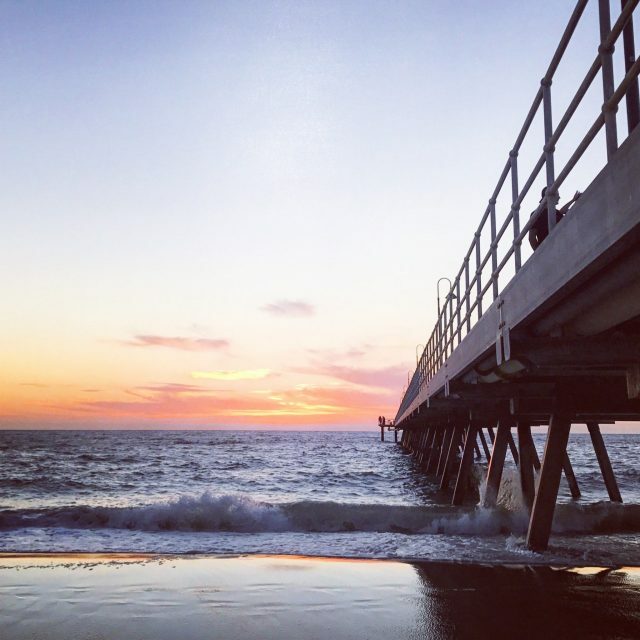 The Hotel is located at the end of Jetty Road, right in front of the Glenelg beach and has some prime views. After a quick freshen up, we headed out to see what else Glenelg has to offer it’s visitors. As mentioned before, Glenelg is a beachside town about 30 minutes drive from the centre of Adelaide. The main square is located opposite the beach and is a pedestrian only thoroughfare. Glenelg has a cruisey, laid back atmosphere, where you can sit and not do much at all. The main decisions of the day are what time to head to the beach or what to eat. You will be spoilt for choice, with many eateries lining the main square and further down the street. 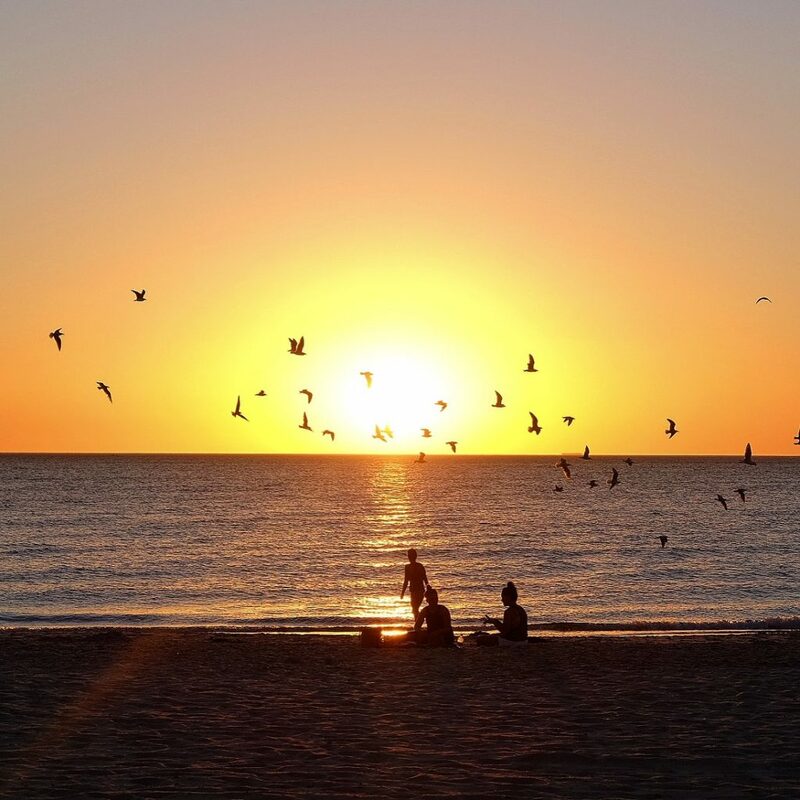 Evenings are when Glenelg really comes alive, as people flock to the beach to witness the sunset. The sunsets are truly incredible, as the sun slowly slips into the sea. Don’t leave Glenelg without watching mother natures spectacular show. 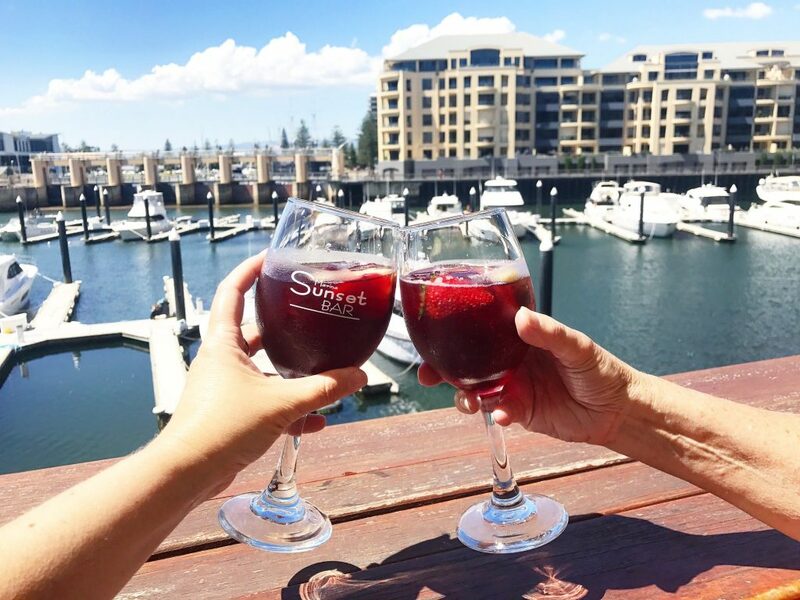 The Glenelg Marina is another hot spot for eating, drinking and watching the boats in the small harbour. Here you will find coffee, bars and a variety of good restaurants. The Marina is just a short stroll from the main square. Being such a casual place, we slept in and then decided to head into Adelaide via the tram. The tram stop was right out the front of our hotel and it is also the end stop too. I had already researched on places to go for breakfast or brunch. I came across a cafe that serves fabulous imaginative food called Trouble and Strife. I tried the ‘eggs benny’ with pulled pork, a modern take on the old favourite eggs Benedict. The cafe is located in a lovely suburb called Goodwood and it was also one of the tram stops. After our brunch come lunch, we got back on the tram and headed straight to the Adelaide CBD. Our first stop was to the pedestrian only Rundle Mall, a shopping street that has your retail therapy covered. As the Adelaide Fringe Festival was in full swing, we got to see a lot of street entertainment as we walked along. 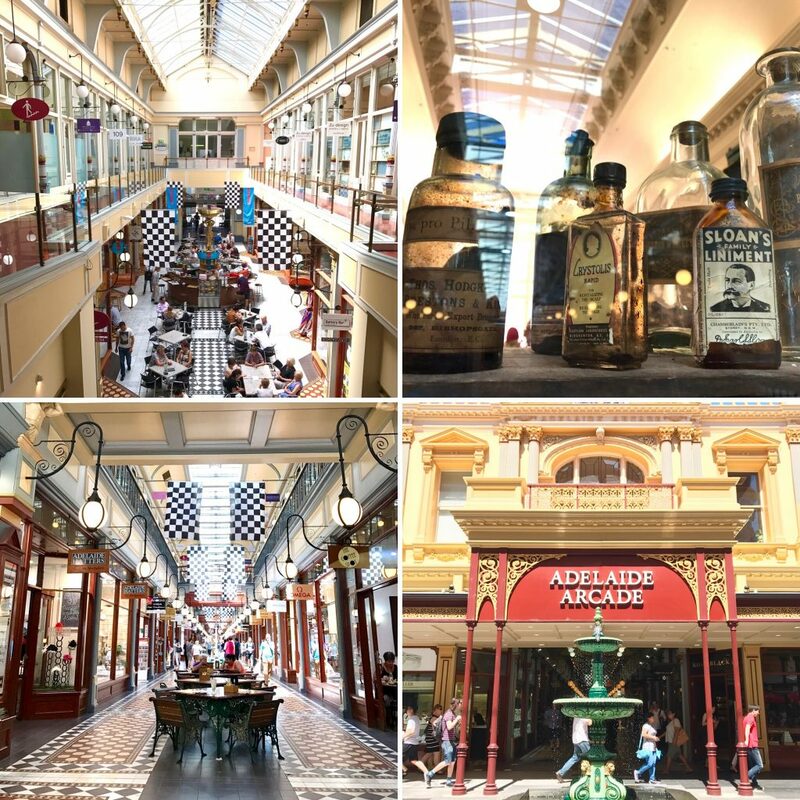 We took a detour inside the Adelaide Arcade which is a heritage building built in 1885. It features around 100 boutique shops, some reminiscent of days of old. The architecture and the shop fronts let you take a step back in time and there is a gorgeous green fountain out the front. A further wander down the mall, I came across an interesting art sculpture. It’s actually synonymous with the Rundle Mall and it’s called ‘A Day Out‘. 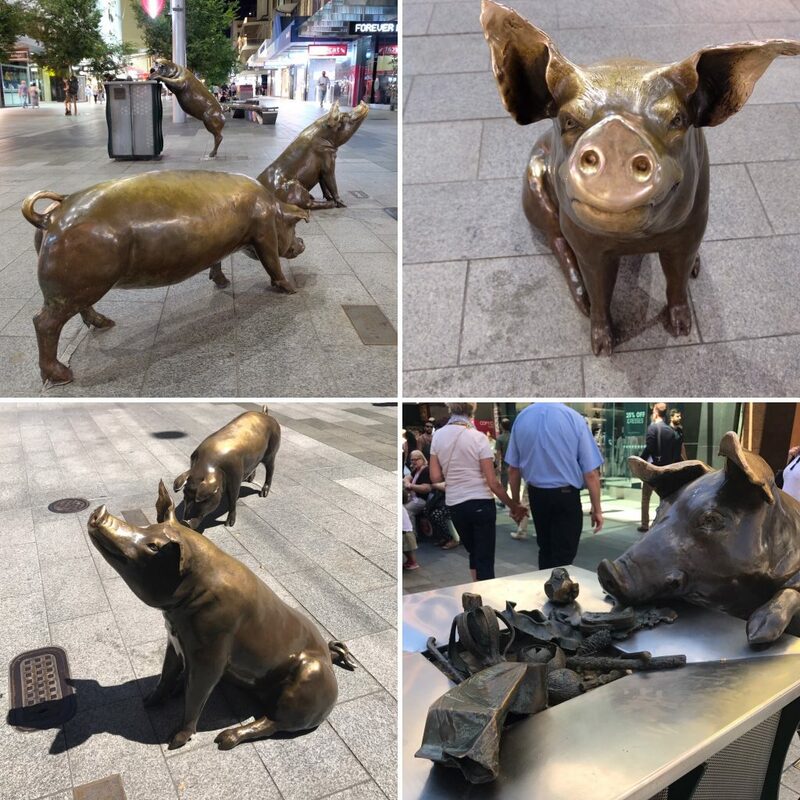 I found the pig sculpture quite hilariously funny, with one of the pigs looking in the bin. They are life size, so you see lot’s of kids climbing on them for a bit of fun. After being shopped out, we decided to go and have a look at the Adelaide Casino and the Art Gallery of South Australia. A short walk later and we found ourselves at North Terrace, where there are some wonderful heritage buildings lining the street. The Art Gallery is very impressive, offering a huge collection of Australian landscapes and artists who made the journey to Australia during colonial times. Whilst we were visiting, they were screening a short film by Del Kathryn Barton, called RED. Barton describes RED as a surreal, savage tale of female power inspired by the mating rituals of the redback spider, which stars Blanchett, actor Alex Russell and the Sydney Dance Company’s Charmene Yap. It is indeed a very dark and confronting piece that goes for about 15 minutes. The Adelaide Casino is located in the heritage listed Adelaide Railway Station. The Casino officially opened in 1985, after redevelopment of the North end of the building. Within the main gaming room, you can still see the grand heritage features of days gone by. Unfortunately thats where the class ends, as other rooms have been modernised and there is no dress code enforced. We decided to have a little flutter on the ‘pokies’ and ended up doubling our money. With our winnings in our pockets, we headed down to Adelaide’s eat streets. Peel Street and Leigh Street are located side by side, are pedestrian only and offers a number of eateries and bars. If you are looking for drinks then you can’t go past Pink Moon Saloon, Clever Little Tailor and Udaberri. These places are very popular with the locals with tables spilling out onto the street. The after work crew on a Friday night make this a very popular destination. We stopped and had a casual dinner in Leigh Street at Casablabla. It’s reasonably priced and offers tapas food and cocktails. We finished off the evening with watching another beautiful sunset across Glenelg Beach. We started the day again at The Organik Store and Cafe, (when you are onto a good thing you stick with it)! Being a Saturday morning, it was quite hectic with locals lining up for their coffee and we had to wait for a table. This was in stark contrast to our previous visit on the Thursday. I certainly didn’t mind the wait, as the food is excellent. Later on in the afternoon, we jumped on the tram and headed into the Adelaide CBD for a busy night ahead. 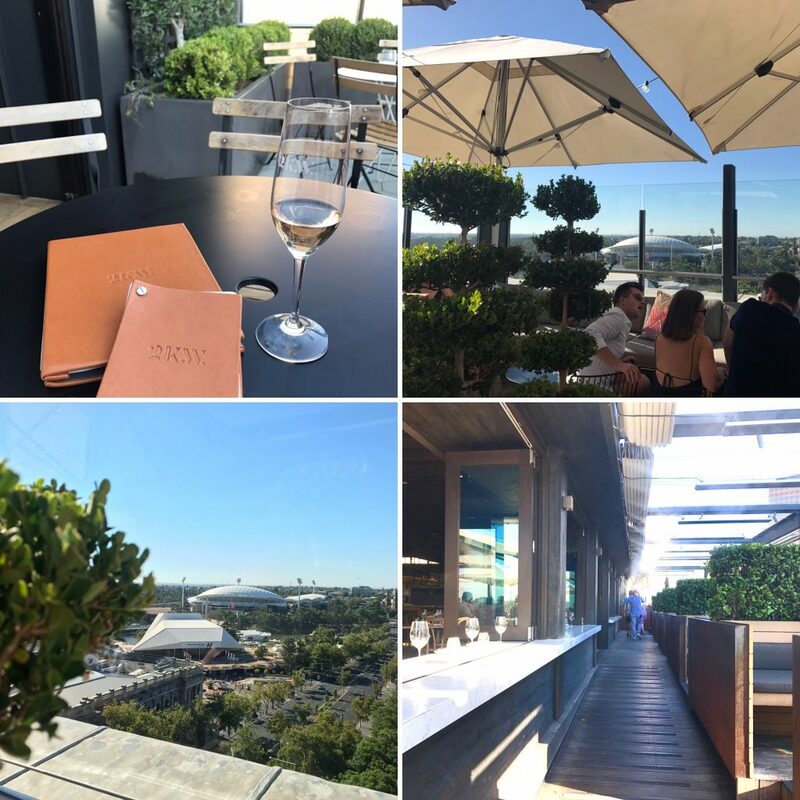 2KW is a rooftop Bar in Adelaide’s CBD that has some great views to the north of the City. The name 2KW comes from the street it resides on – King William and it is located on the 8th floor of a heritage building. We stopped here for a drink and a bit of a wander about the place to see what all the fuss was about. It has some fantastic spaces and we especially loved the private cabana’s. You will need to book a cabana as these are really popular. The views are great, whether that is of the buildings opposite or across to the parkland. The bar serves classy snacks, cheese boards and light meals. If you want to go all out then it’s the restaurant that you will want to be at. 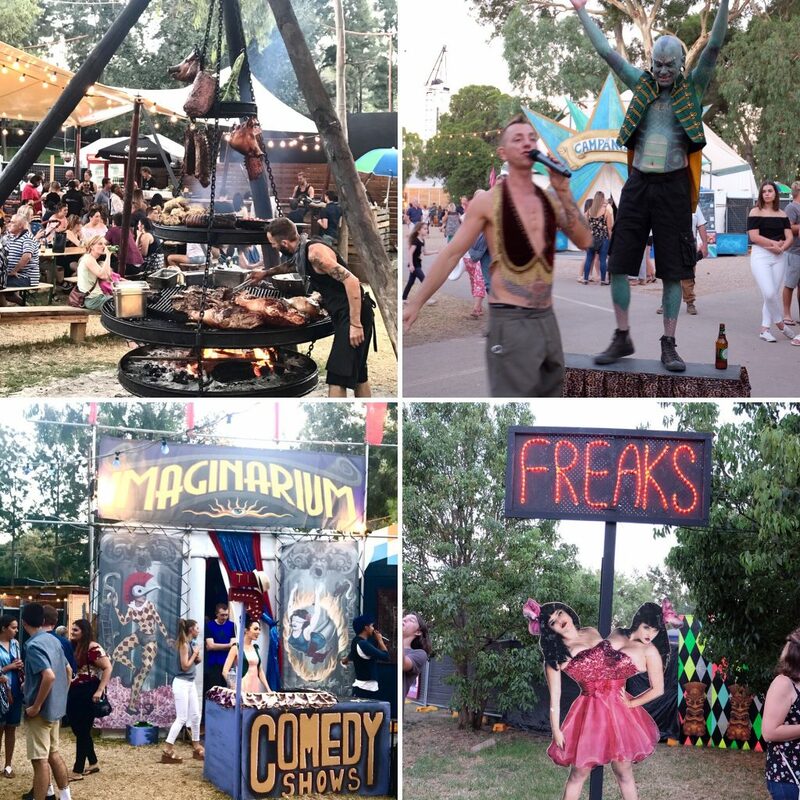 The Adelaide Fringe Festival is an arts festival that has been going around for about 56 years. The Adelaide Fringe takes over Adelaide during the month of March with a fun and mystical atmosphere. It’s a great time to be visiting Adelaide as there is a lot going on. All kinds of people, come from around the world to share their unique art. You’ll experience street performances, pop up shows and a big carnival like space in the Garden of Unearthly Delights. 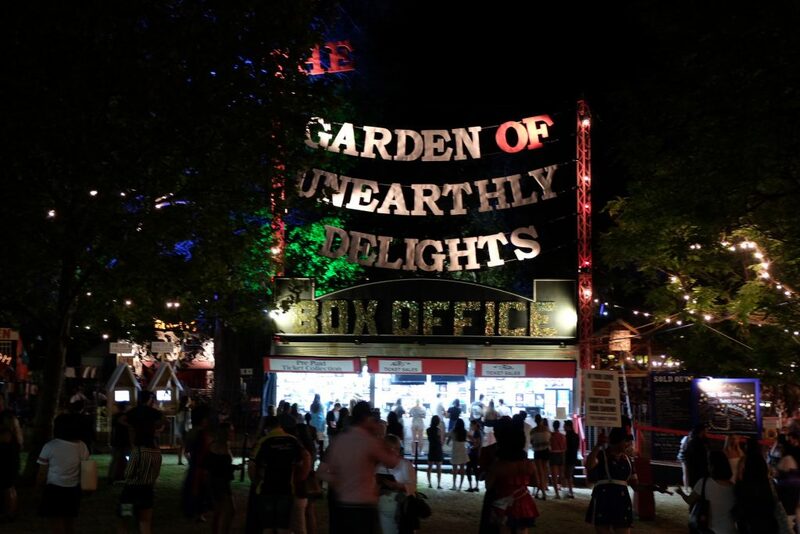 In The Garden of Unearthly Delights you will be swept up with the carnival like atmosphere. There are live performances inside small to large marquee’s, tickets can be bought impromptu and won’t burn a hole in your pocket. We saw two shows, one a comedian show that went for 20 minutes and the other was a freak show that went for about 30 minutes. It’s not often you get to see some great shows for under $10. They are short in duration, so that gives you plenty of time to go check out what else is on in the gardens. There are lots of food trucks, pop up bars and carnival rides. There isn’t a lot of seating, so be prepared to sit on the grassy areas to eat or have a drink. A visit to Adelaide isn’t a visit unless you visit one of the wine regions. The most popular being the Adelaide Hills, Barossa Valley and McLaren Vale. The closest (Adelaide Hills) is around a 45 minute drive away, the others just over an hours drive away. I was originally going to hire a car but I found this new company called Trail Hopper tours that runs like a shuttle bus to a number of wineries within a region. Booking a seat on the trail hopper is far cheaper than hiring a car and you don’t have to worry about drinking and driving. This solved all the logistics of getting around the wineries, with the hardest decision being which region to visit. 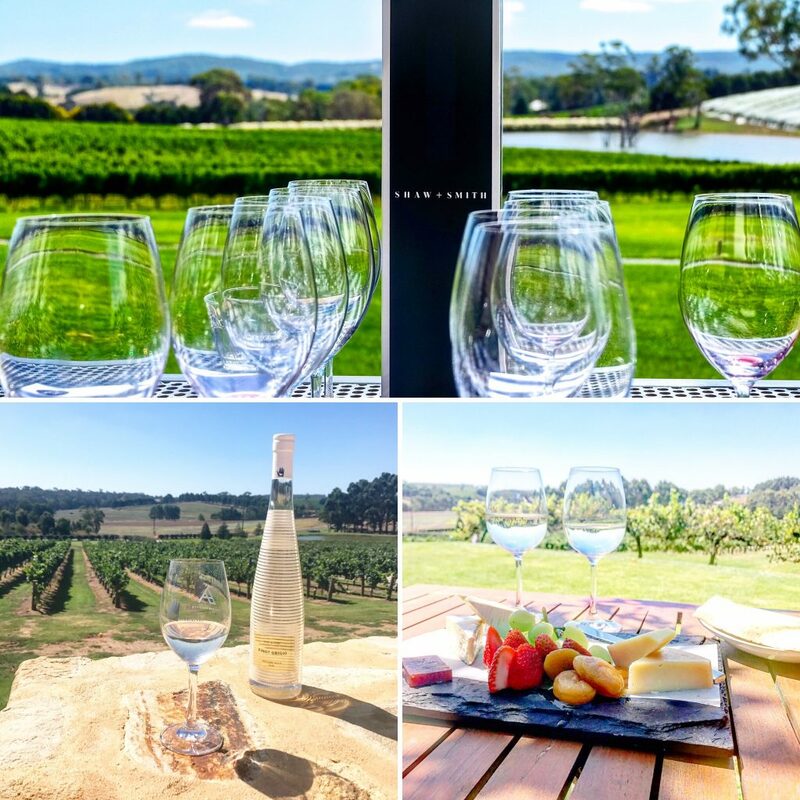 We decided to check out the Adelaide Hills wine region as they have a lot of boutique wineries, where you can try wines that are only available at the cellar doors. I also chose the Adelaide Hills because the region is picturesque, with the beautiful hills and valleys as a backdrop. Although there is a number of wineries on the list, it was recommended that you choose a maximum of four wineries to visit. We chose three, the Lane, Shaw & Smith and Bird in Hand. Each of these wineries have their own unique way of presenting their wines, with The Lane and Shaw & Smith matching their wines with cheese plates as part of the experience. We decided to stay at Bird in Hand for a long lunch, where they offer the choice of fine dining in the restaurant or simply enjoying a cheese or charcuterie board with your wine. The time table allows you to choose how long you would like to spend at each winery, so you can tailor your own experience. You just let the driver know what time to pick you up and then it’s on to the next winery. This all worked like clockwork and I can highly recommend this as a way to get around if you don’t have a car or you don’t want to drive. Our final day in Adelaide, was more of a half day as we were due to fly out in the afternoon. We checked out of our hotel and left our bags with the concierge and once again caught the tram to the CBD. I had one food destination that I really wanted to try, so this was our last opportunity to check out Peter Rabbit. 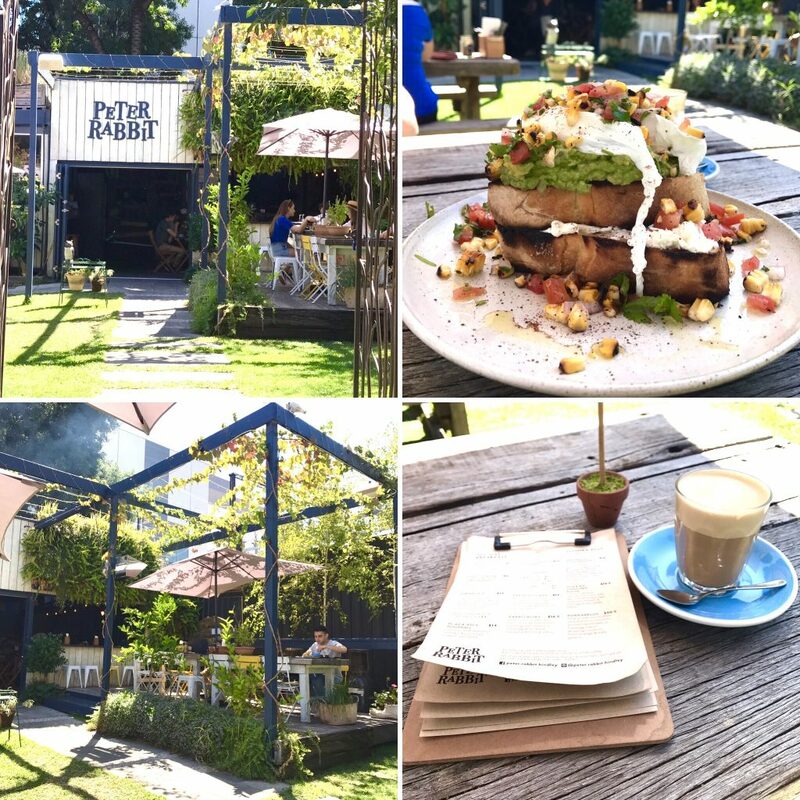 Peter Rabbit is a cafe located about a 10-15 minute walk from the Adelaide Railway Station. This place is definitely worth the walk, as the food is imaginative, tasty and are very big serves. Set in a cute little garden setting, it’s a little oasis in the city to get your coffee or big breaky fix. 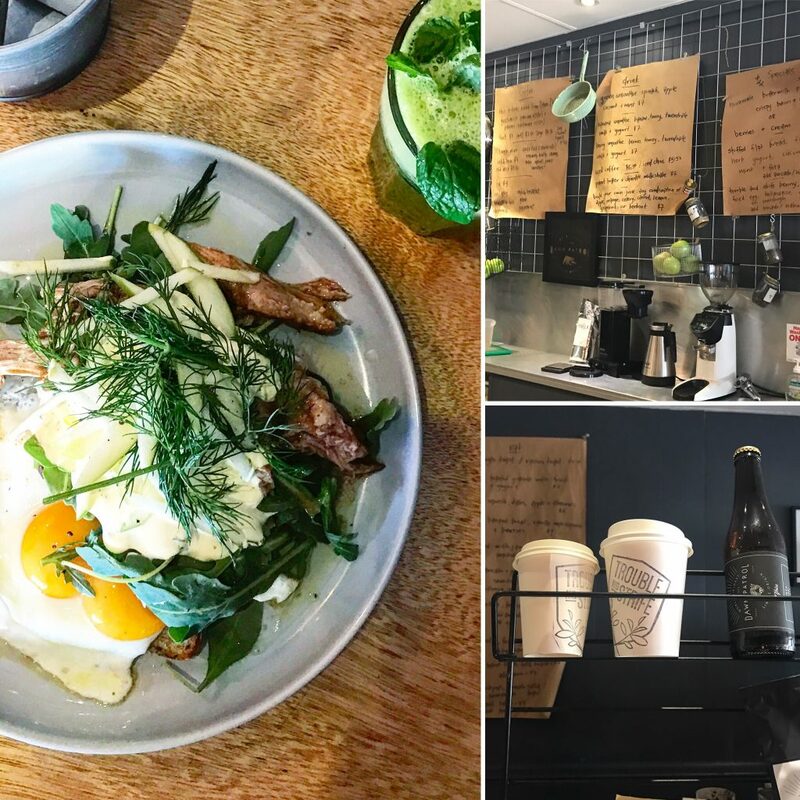 If you only get to visit one cafe in Adelaide make it this one! 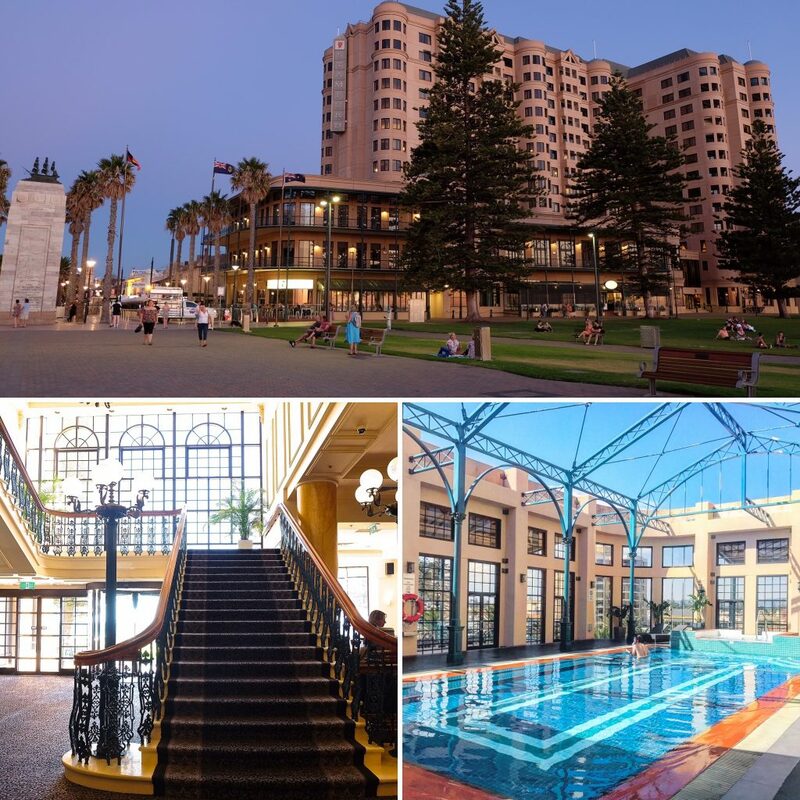 I stayed in Glenelg at the Stamford Grand, a great hotel with lots to offer. Review coming soon. Need to see prices for this hotel? HotelsCombined will check all major travel booking sites, compare hotel prices and find you the best deal available. Click on the link below to see prices.